Zoho Desk is armed with intelligent automations and SLA rules to help you run your helpdesk more efficiently. Don't let tickets fall through the cracks. 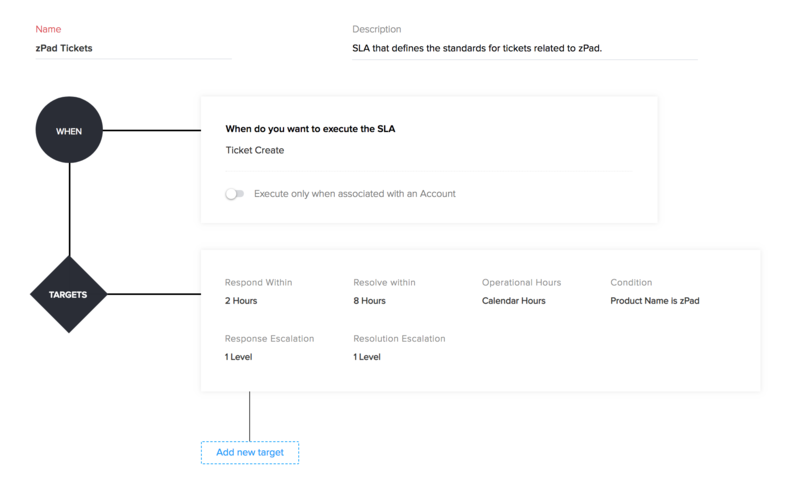 Service Level Agreements help you automatically set a due time for tickets based on criteria like the channel the ticket came from, the customer who raised the ticket, and the status of the ticket. This helps your agents decide which tickets need their attention immediately and which tickets can be solved later. When SLA violations arise, Zoho Desk automatically escalates the overdue tickets to the relevant manager or agent. You can customize a simple set of rules to govern these actions and manage tickets more efficiently. Managers and supervisors can create a custom view to see a list of all SLA-Violated tickets.They can then step in and manage these tickets either directly or by assigning them to another team member to ensure timely resolution. Track the progress of the entire customer service effort, such as number of overdue tickets, SLA breaches, and average response times. These are important indicators of how well your team is functioning.Track them using custom reports, that can be easily generated and delivered to your inbox, automatically.